I’m not even going to say anything about the shoes, but where do you even get a headband like that? You hear a lot of noise about the children. Think about the children. How will we explain this to the children? Children are a lot more open-minded than adults, and a lot better able to assimilate information that diverges from their previously held worldview. Children like to be initiated into the secrets of the world. So, you know how we explain this to the children? With simple unbiased, age-appropriate words, providing additional information as appropriate, because there aren’t any important conversations we have with our kids just once. We communicate our values through word and action, and if we show the children that it’s OK to be who you are, even if you’re different, then we raise children who learn to be kind and accepting of themselves and others. We teach that the world requires many different ways, and that it would be dull and flavorless if we were all exactly alike. We celebrate diversity wherever it can enrich our understanding of our condition. If we communicate fear and hatred, we raise children who learn to loath their own uniqueness and torment those who dare to express their uniqueness honestly. We teach them to police themselves, to ridicule divergence and lack of conformity. We drive everything that doesn’t fit within our rigid boundaries underground and then we congratulate ourselves on keeping things orderly, of proving to ourselves that clearly, ours is the only perspective, because we’ve silenced all the other voices. Mostly, though, we have to trust kids to know who they are. Our labels and our perception can’t get at their inner truth; they have to get at their own insides themselves. We have to let them know that we trust them to tell us who they are, even if they are something we do not yet understand. That’s what we tell the children. 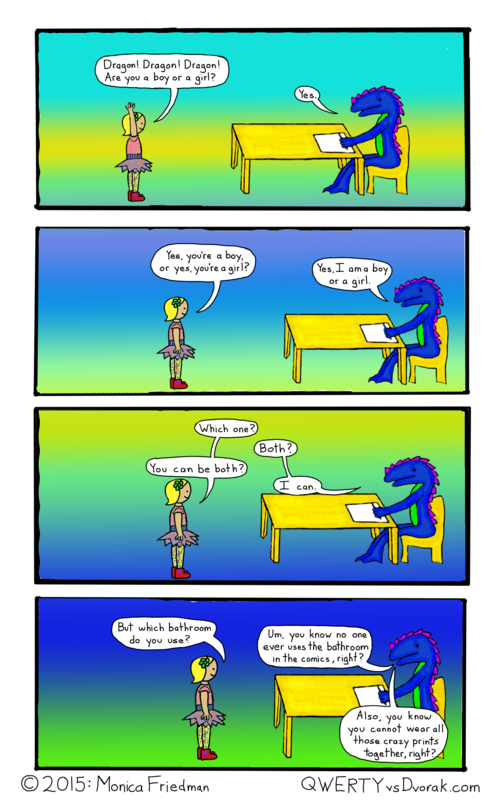 This entry was posted in dragon comics and tagged boy, clothing, gender, girl, identity on June 18, 2015 by littledragonblue.